Even before it had a name, the church that would become St. Benedict's had been conceived in the mind of the Rt. Rev. Henry I. Louttit, Bishop of the Diocese of South Florida. Realizing the potential growth of the Plantation area, he recognized the vital need for an Episcopal Church in the western section of Broward County. A meeting was held in March of 1960, with nearly fifty people in attendance, led by Father Robert Liebenow, then rector of St. Ambrose Parish, Ft. Lauderdale. Father Samuel Fleming of All Saints Parish was also instrumental in the formation of the new church. As interest grew, so did the nucleus of people destined to become the first parishioners. In April of 1960, the people unanimously chose the name of St. Benedict's for their church. On May 29, 1960, St. Benedict’s first church service was held at Broward Estates Elementary School, with Father Liebenow as celebrant. There were sixty-seven people in attendance. The following Sunday, June 5, St. Benedict’s was assigned its first temporary vicar, the Rev. Ernest J. Alt, who was also the vicar of St. Mary Magdalene Church in Margate. Within a year’s time St. Benedict’s growth clearly indicated the need for a priest of its own, and the Bishop appointed the first permanent resident vicar, The Rev. William L. Stevens. Father Stevens conducted his first service on May 21, 1961. In October 1961, ground was broken for the construction of St. Benedict’s first building. This was made possible by a generous gift of $12,000.00 from All Saints Church, Ft. Lauderdale, which was used toward the purchase of land. We moved into the new building on Palm Sunday in April 1962. Two years later construction of the Sunday school building began. It opened for classes on May 10, 1964. A significant milestone was achieved on April 13, 1967, when we were granted parish status by the Diocesan convention in Tampa. On May 25, a Solemn Pontifical Mass was celebrated and Father Stevens was instituted as the first Rector of St. Benedict’s. An office wing, parish hall, and additional classrooms were added in 1971. Several prominent additions, to the church building were made, including the Mark Bell erected in 1974. Mark was a faithful and accomplished acolyte whose death was the result of an accident. The bell was given in his memory by his mother Dottie Pehrsen and Mark’s friends. The wood-carved crucifix was hung over the high altar in 1976. It was a gift from the parish family to honor Father Stevens fifteenth year as rector. The expansion of the east wall of the church took place in the same year, creating space for the Mary Chapel. In 1978, the Memorial Garden was completed. The stained glass windows were started in 1979 and completed in 1980. These windows are now installed in the new church hall. The windows depicting the Stations of the Cross are now installed in the new church. In celebration of our Silver Jubilee in 1986, our mortgage was burned, and the parish family gifted a new sign for the front lawn. 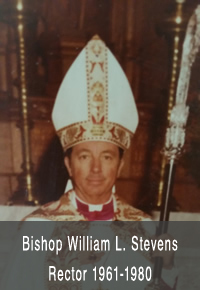 Father Stevens was elected Bishop of the Diocese of Fond du Lac, Wisconsin in May of 1980. He was succeeded by the Rev. 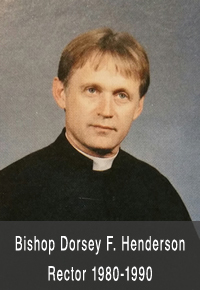 Dorsey F. Henderson, who left on January 1, 1990, after accepting a call from Fond du Lac to serve as Dean of St. Paul’s Cathedral. The Rev. 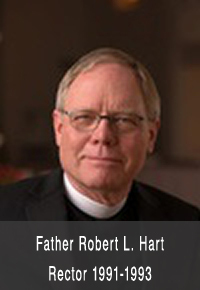 Robert L. Hart succeeded Father Henderson. The Rev. 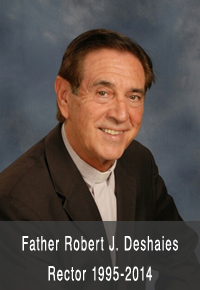 Robert J. Deshaies, known to everyone as "Father Bob" arrived in August, 1995, built our beautiful new church to accommodate our growing numbers of worshipers and led the parish until his retirement in August, 2014. 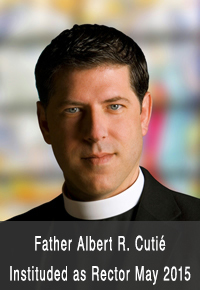 Our Rector, The Reverend Dr. Albert R. Cutié, is a priest of the Diocese of Southeast Florida. Father Albert has been a parish priest for 20 years in various parishes throughout South Florida and has also worked extensively in various forms of media. He is committed to continuing the legacy of St. Benedict's, which is to ensure our parish is a place where all people are spiritually renewed in their faith and energized for Christian discipleship in our world.